I took my kids to a new indoor play area in San Diego today called Java Mama. Well, it’s not that new, probably a year old, but it’s new to us since we haven’t been there until now. The kids absolutely loved it and got to play with lots of toys we don’t have at home and climbed up and down a two-story house with balcony about a two dozen times. Very exciting morning! They even have an outdoor playground structure but I decided to skip it. We’ve suffered from super high temperatures this past week and of the baking sun causing them. Yes, I think baking is the appropriate adjective when you can feel your skin burning if you stay in direct sunlight just a few minutes. So there was no way I’d let my kids play in the sun even though I know they would have enjoyed the structure. At least I know where the place is now and we’ll definitely go back. Besides I didn’t see any cows there today so I know I have to take a closer look next time! After a couple of hours playing, the kids were starving for lunch so we joined their dad just down the road at Mimi’s Cafe. We even had a coupon for our meal, what’s not to like? This is a new location for me – I’ve only been there once – so I was curious to see if they had a cow somewhere since our local restaurant doesn’t. This is an old ad for the swiss processed cheese. 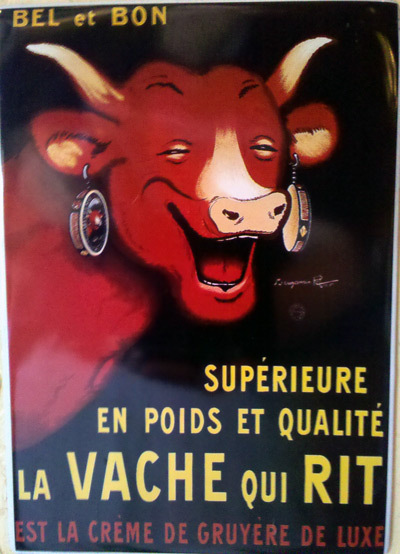 I’ve always loved the earrings made out of the cheese boxes and I can almost hear the cow’s laugh whenever I see its wide grin. Thanks, Mimi’s, for the good food and for the flashback!